You hear a lot of talk these days about crowdsourcing — the idea of using a large online community to complete tasks as diverse as compiling an online encyclopedia (thank you Wikipedia!) or creating a database of popular bars that directs you to watering holes around the world. It’s such a great concept, and yet, based on my conversation with other B2B content marketers, I’ve found that it hasn’t been incorporated into many content creation and promotion strategies. That’s why I’ve put together this short list of questions that will help you gauge how good a job you are (or aren’t) doing of crowdsourcing your content creation efforts. If you can’t answer yes to all of them, chances are that you’re missing out on a few opportunities for easy wins. 1. Are you soliciting and (more importantly) leveraging comments? Go back to the commenter with the follow-up questions: Between the original comments and any additional input you get, you may be inspired with ideas for creating a completely new piece of content. At the very least, you will walk away with a new idea or point of view, which is always helpful as you brainstorm future content creation ideas. 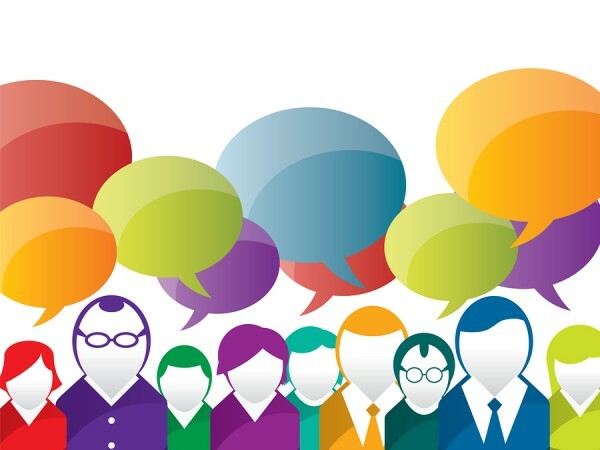 If your commenters express different viewpoints than yours, draw them out and engage them in a debate. The resulting material could be great fodder for a podcast or video chat in which you explore the topic from multiple angles. Doing so will produce interesting content that will likely spawn even more comments. Wherever appropriate, repurpose comments as quotes or testimonials. Depending on the source, they could lend some credibility to other projects that you’re working on. Another option to consider is simply putting a question out into the ether and allowing the answers and comments that come back to populate the body of a blog or social media post. If you’ve posed a really provocative question and do a good job of getting it out in front of people with strong opinions, you might receive enough crowdsourced material to develop an entire piece of content from start to finish. It doesn’t get much easier than that! 2. Are you engaging your audience with surveys and polls? These days, myriad survey tools are available to help you reach out to your audience and get feedback. One of my favorites is PollDaddy, which is easy to use and can be directly integrated into WordPress. The advantage of using survey tools and plug-ins is that not only are you creating another way for people to engage with your content, you are also gathering useful data in the process, which can ultimately be turned into more content. For example, if you are publishing a series of articles about a common topic, consider adding a question or two at the end of each one. After the series is complete, you will have a bunch of data that you can then leverage into new content pieces. A tool that I’ve found to be particularly effective for this is TechValidate. Not only does it help you create surveys, it also automatically creates charts and graphs for you based on the responses you receive. 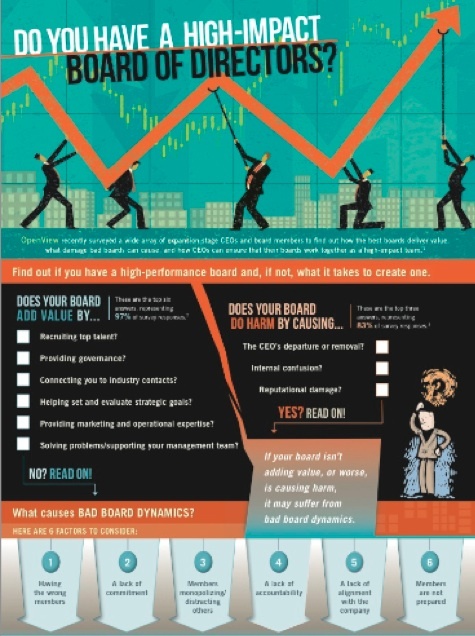 By embedding a survey about boards of directors into a recent OpenView newsletter, we were able to gather enough data to put together an infographic. The result was a visually compelling piece of content that allowed our audience to compare their opinions to those of their peers — it was a huge success, and the resulting content virtually created itself. 3. Are you working with industry influencers? Working with industry influencers and leveraging their expertise and thought leadership is a great way to amplify your content strategy. For example, consider co-opting influential business professionals to write original posts for your site, to participate in your videos and podcasts, or simply to help distribute your content throughout their own followers. Identify the experts that your buyers are being influenced by: You can use a bit of online research — like checking out blogs, looking at social media activity, and comparing Klout scores — to find out who’s leading the most relevant conversations in your industry, and determine whether your target audience is listening to them. Establish initial contact with those influencers, perhaps by following them online or posting a comment to some of their content. The idea is just to make them aware that you exist. Pitching the influencer on your value proposition: Make sure you communicate the benefits that creating content for your site will provide to them — such as exposure to a broader audience, or the opportunity to create content in a different format than what they are already producing. Reduce the chance that they will turn you down by making the process of working with you as easy as possible. For example, you could offer to interview them and draft content on their behalf, so that you’re getting their ideas but aren’t asking for too much of their time. 4. Are you taking full advantage of social media? Ok, you may be thinking yes, of course, I’m using social media. But to be clear, simply having social sharing tools embedded into your site isn’t the same as actively crowdsourcing your content creation and promotion through an effective social media strategy. The fact of the matter is that if you have good content and do social media well, everything you create should have the potential to go viral — meaning that others will voluntarily share your content for you. When I use social media to promote a piece of content, one thing I keep in mind is how important it is to reach out to my audience multiple times — so I don’t risk my message being overlooked. For example, I rely on social scheduling tools like HootSuite or Buffer to send out each of my tweets multiple times, at varying intervals. Typically, I schedule four tweets to go out eight hours apart so that I’m covering a variety of time zones. And, provided the particular piece of content is on an evergreen topic, I may even schedule it to be sent out several more times over the next few months, maximizing the chances of my followers seeing it. There are lots of ways that crowdsourcing your content creation and promotion efforts can make your job easier — not to mention more effective. What tactics are you using? What were your results? Who knows? Maybe some of the comments you contribute below will make their way into a future post! Looking for more content creation ideas and inspiration? Join Kevin Cain, and dozens of other content marketing experts, at Content Marketing World 2013, taking place in Cleveland, Ohio on September 9–11.